If fake job offers are on the rise, so are fake work experience certificates. HR experts are, of late, seeing an increase in an undesirable trend whereby people who have been jobless for over one year are faking work experience in order to entice prospective employers. “There are many people who graduated in 2009, 2010 and have not managed to get any employment. Having zero work experience puts them out of favour with most employers. Hence some are ready to go to just any extent to bag a job,” said Kris Lakshmikanth, managing director of search firm, HeadHunters India. An HR official from a mid-sized company in the city recalls having interviewed a job seeker few months ago who claimed to have worked in a call centre, and produced a letterhead of that company on which his tenure and role were mentioned. The letterhead also carried the signature of the HR manager of that firm. “I have worked as a HR for decades now. I suspected something fishy with this candidate. Only after grilling him thoroughly he confessed to the lie. He had indeed worked in that firm, but not for 18 months as the letterhead claimed, but only for three months as he was asked to leave. Of course the designation on the document was also dubious,” said the HR official. Experts say nearly 10% of the CVs that reach HR managers carry some element of untruth. HR experts attribute this trend of faking to the frustration of not having found a job and the desperation to get one. Also partly responsible are companies that demand work experience from candidates who are not fresh graduates. “Even if you graduated, say, in June and have not yet found a job, you can get sidelined by companies,” said Aneesh G Laikar, managing partner of executive search firm StarChase. When the hiring scenario weakens, like it has happened in recent months, graduates from lesser-known colleges are the first ones to get affected. “Companies limit their recruitments and go to only famous colleges. 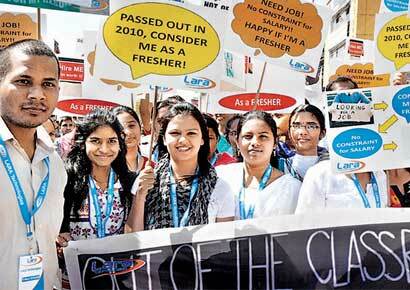 Students from lesser-known institutes have to then find jobs by themselves. And getting a job in the open market without contacts turns out 100 times tougher than through campus placements,” added Bhupesh Gupta, director of recruitment firm Krizalis Consulting. And with each passing day, the jobless candidate, who was once a fresher gradually, turns into old stock for companies, as every year an influx of freshers enters the job market. Neither posting resume on job sites, nor knocking doors of companies and placement agencies helps. “Being jobless in India is looked at as some sort of defect in the candidate, who then becomes not hireable,” said Laikar. That is when some candidates let go of the fear of getting caught by faking work experience, added Lakshmikanth. Getting a fake experience certificate is no tough task. “If people who have never stepped into colleges can produce a degree from top universities, getting a work certificate of any small neighbourhood firm appears quite simple,” said an HR official from the mid-sized firm. Experts say if unscrupulous elements can lay their hands on the letterhead of a company, the remaining task is a cakewalk. “Curbing this practice is possible only if companies are extra careful and do background checks, which often small firms fail to do,” added Lakshmikanth. According to B Rameshwar Reddy, CEO of Lara Technologies, which held a rally recently against fake job experience certificates, companies should consider all unemployed candidates whocome for jobs as freshers and give them the necessary training. “Companies need to change their mindset and look at unemployed people or those who have lost jobs with an unbiased approach,” concluded Laikar.